Create your own kid's t-shirt design and make getting dressed in the morning a fun activity. Available in sizes to fit ages 3 - 13, there's one to customise for all the youngsters, including personalised t-shirts for toddlers. Printed with your unique photos or design on the front and back, this all over print t-shirt is the perfect playtime clothing. Made from poly-jersey, this personalised kids t-shirt is easy to care for and long-lasting. Children love to dress themselves, so why not go one step further and let them design their own t shirt? Not only does this encourage their creativity, but they’ll look totally unique and will no doubt want to show it off to schoolmates. You can even create one with their name on the custom clothing label to make sure it doesn’t end up on someone else. The t-shirt quality is really good. The making and delivery service was fast. I am only disappointed about setting the delivery address different than the billing one and the T-shirt being sent to the billing one. When contacting I left a message explaining with my contact number but no response. I needed to collect the T-shirt to the billing address. Superb quality, excellent service and overall brilliant experience every-time!! Exceptional quality and standard of make is outstanding! I am always pleased with the service provided by Bags of Love. Thank you so much! For 3-yr-old-granddaughter, this T-shirt with large mugshot of the family dog (back AND front!) was a perfect gift. I ordered it just before Christmas, was notified quickly that it was ready, and it arrived in time - thank you. Good colour and material, well-made. Try telling them "make your own t-shirt" and then bring their quirky drawings to life by printing them onto a custom t-shirt for kids. Whether they’ve invented a new dinosaur with six hands and three feet or attempted to draw the family home, t-shirt printing for kids can see their imagination blossom. Personalised t-shirts for toddlers designed like this also make a sentimental gift you can show them in years to come. Custom printed t-shirts for kids are a great way to encourage cooking. Upload a photo of them in a mini chef’s hat with ‘Name’s Restaurant’ printed on top and come every dinner time, they’ll be ready for service. These bespoke tops are fun for brothers and sisters to design themselves. 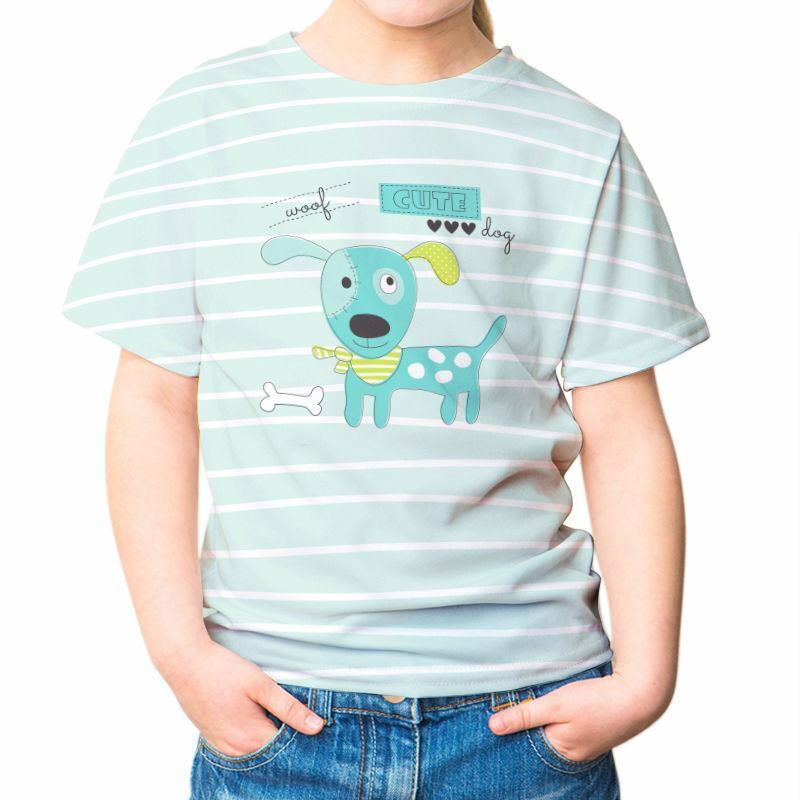 Whether your son is into science or your daughter loves dogs, they can express their individuality through custom-made t-shirts. Add humorous slogans to their awesome ideas, and give them the satisfaction of "I managed to create my own t-shirt". You could even use a baby photo or their favourite image of the dog. Like many of our products, custom kids’ t-shirts come with a quantity discount, so get one for all the little ones today and save money. Our print specialists use eco-friendly inks to penetrate deep into the fibres of your kids poly-jersey t-shirt. This infusion technology creates a long-lasting print which will not scratch away, or rub or peel off. Our specialist digital printing process gives a deep, lifelong print to your custom kids’ t shirts. We suggest opting for designs that don’t need to be accurately lined up from front to back, as this isn’t always possible – as seen below. Anyway, kids will prefer to make two designs with completely different pictures on either side. Sometimes on these t-shirts, the final print can look similar to what’s seen in these pictures below where some small white wrinkles appear in the underarm area between the sleeve and the body and the collar area. However slight discrepancies are to be expected with such technical printing processes. Personalised pencil box. We print a quality image and gloss laminate it to the tin box to make a personalised pencil boxes.